We're visiting Egypt. We have been in the city of Cairo and its nearby Giza plateau with the Pyramids and Sphinx. Then it south by train along the Nile to Luxor and the Valley of the Kings. I went as far south as Aswan and beyond that to Abu Simbel. 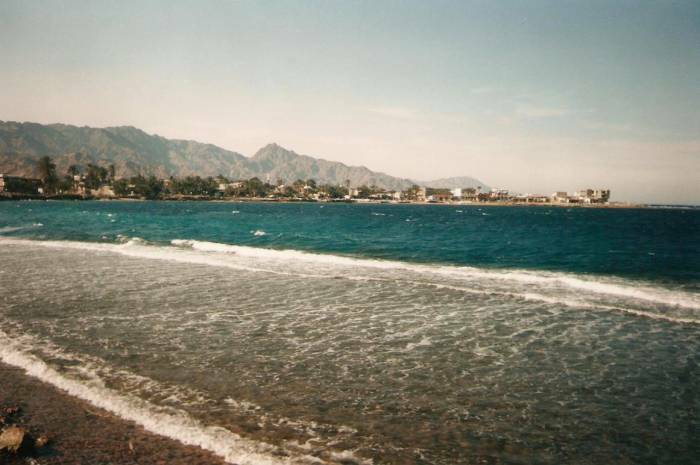 After returning to Cairo for a couple of days to wait for my Syrian visa to come through, I took a bus from Cairo to Dahab, on the Gulf of Aqaba coast of the Sinai peninsula, north of Sharm ash Shaykh. This was a long day of travel on a bus that left Cairo early in the morning. First, east from Cairo to the Suez Canal and across it near the city of Suez. The ancient Egyptians tried but failed to construct east-west canals joining the Red Sea to the Nile, and thereby to the Mediterranean, as far back as the period 1897–1839 BC in the Twelfth Dynasty. Aristotle, Strabo and Pliny the Elder all wrote about these projects. Darius I of Persia (550–486 BC) finally finished this project by taking advantage of some natural waterways. Herodotus wrote that the canal of Darius was wide enough for two triremes to pass with their oars fully extended, and long enough that it took four days to travel between the Red Sea and the Nile. Ptolomy II Philadelphus reopened it in 270 or 269 BC, building a navigable lock at the Red Sea end. Another navigable canal had joined Old Cairo to the Red Sea by the 700s AD. The Abbasid Caliph al-Mansur ordered this canal closed in 767. Then Abu 'Ali Mansur Tāriqu al-Ḥākim, who was both the sixth Fatimid caliph and 16th Ismaili imam, repaired that waterway briefly around 1000 AD before it again filled with sand. Napoleon considered building a modern north-south canal to directly join the Mediterranean Sea to the Red Sea. But his surveys, somewhat inaccurate because they were made during wartime in the late 1790s, mistakenly concluded that the Red Sea was 10 meters higher than the Mediterranean. The British and French came along the 1830s and 1840s, and surveyed the route while they weren't being shot at. This allowed them to discover that the two seas were very nearly at the same level. The French Compagnie universelle du canal maritime du Suez or the Suez Canal Company was formed in late 1858 and excavated the canal over the following ten years. The current state of the canal allows ships up to 20 meters draft, a maximum height of 68 meters above the water level, and a maximum beam of 77.5 meters. This allows it to handle larger ships and more overall traffic than the Panama Canal. It is not wide enough for two-lane traffic, so ships have to move through the canal in convoys and use three by-passes when they need to pass in opposite directions. The highway crosses under the canal through a tunnel, so you don't see much of the canal itself when you pass through by bus. From the city of Suez we turned south along the west coast of the Sinai peninsula along the Gulf of Suez. That's a long ride with not much along the way. Around the tip of Sinai to Sharm ash Shaykh, by far the largest settlement along the way. As Lawrence of Arabia famously complained, the various systems of transliterating Arabic words into Latin script for pronunciation by English speakers are contradictory, inconsistent, and incomplete. Sharm el Sheikh is more common in print, while Sharm ash Shaykh is what the U.S. government has used on its maps like the one above. Back on the bus, we continued part way up the east coast along the Gulf of Aqaba to Dahab. It's another 80 kilometers north from Sharm el Sheik, it was dark by the time we got to Dahab. 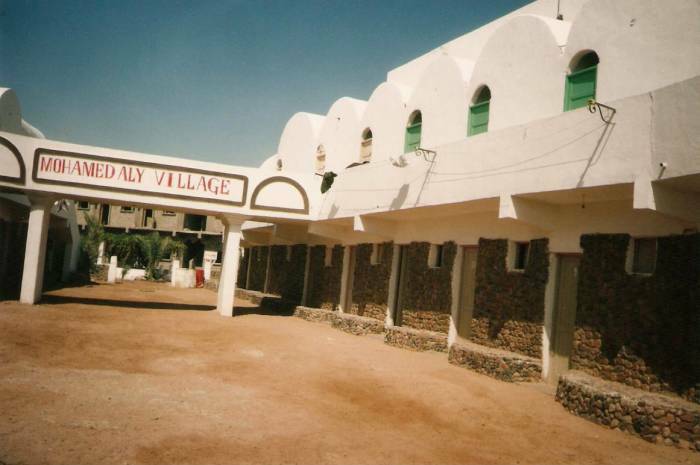 The long-distance bus stops at the modern town of Dahab and its resorts. You get a ride from there to the "Bedouin camp" waterfront in the back of small pickup trucks driven by Bedouins. The Pyramids, Cairo, the ruins at Luxor, and Abu Simbel are all interesting. But the nicest place in all Egypt is the Sinai. Go to Sinai. 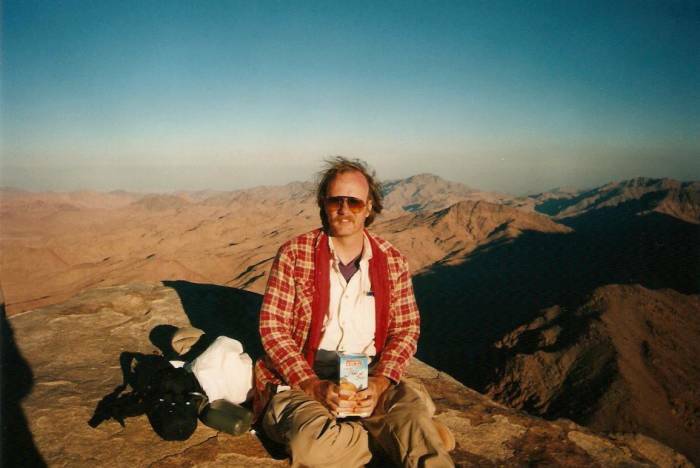 Climb Mt Sinai in the daytime, and spend the night on the summit. 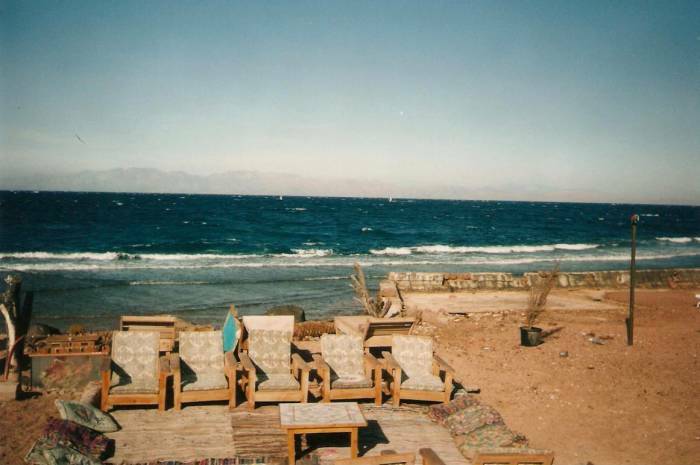 Hang out in Dahab for a week. 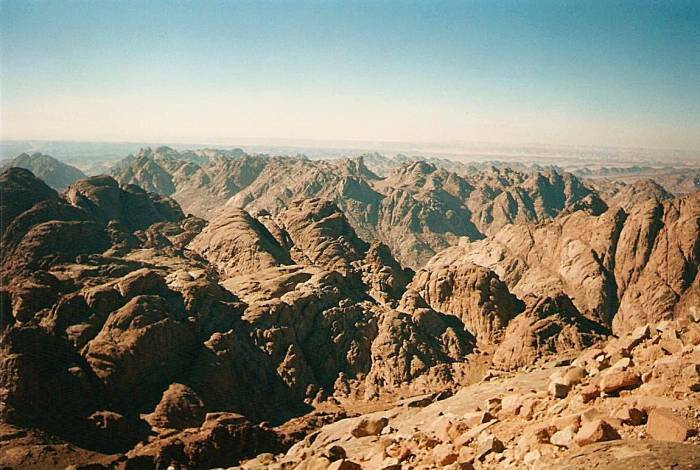 The Sinai is pretty bleak, 60,000 square kilometers of lunar mountains and some flat open areas of sand and rock. However, it is largely a baksheesh-free zone. And so it seems like you have left Egypt for another country. The ancient Egyptians called the area Mafkat meaning Country of Turquoise. The Egyptians were mining turquoise at two locations in the Sinai at least by the time of the First Dynasty, about 3100–2890 BC, and possibly before that. These might be the first real mines. The modern Egyptians still call it the Country of Turquoise, although now the local language makes that Arḍ ul-Fairūz. Or they just call it Sīnā. There is speculation that the name Sinai is derived from the name of the ancient moon-god worshiped at Ur and known as Zu-en or Zen to the Sumerians and Sin to the Akkadians. Or, possibly, it's from the Hebrew term senneh or סנח for the type of bush where Moses had his first theophany. 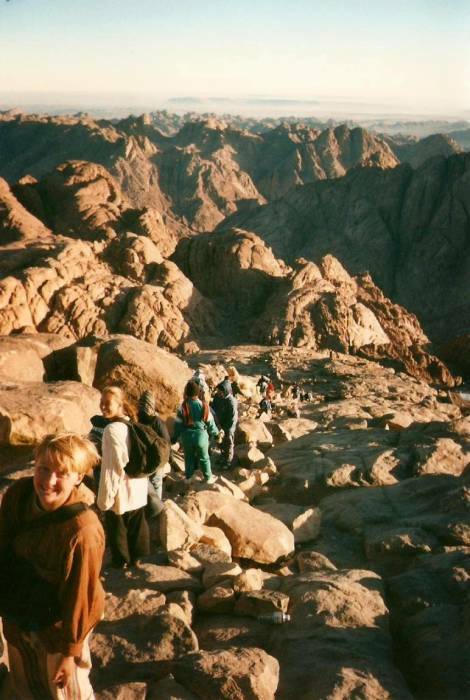 After a night or two in Dahab, I stored my pack at the place I had been staying and took a bus to Mount Sinai. 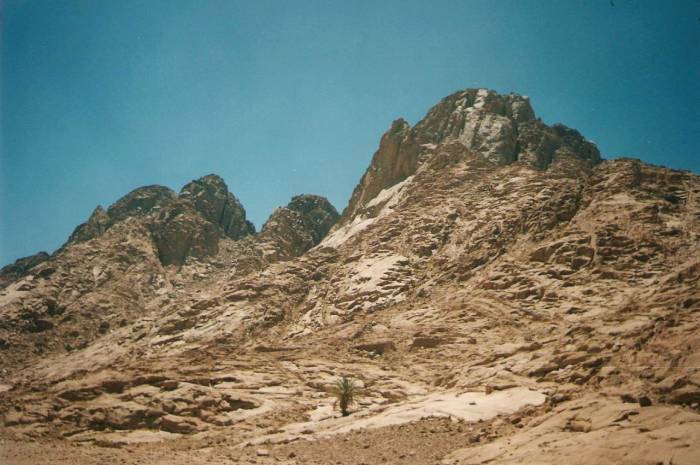 Gebel Musa or Mountain of Moses, the second tallest peak in Egypt and the traditional Mount Sinai, is the peak not labeled here but shown with a building at its peak. It's the second tallest peak in Egypt. the mountain directly to its north. The square above the "y" in "monastery" is the Monastery of Saint Katherine. The open circle above the "n" in "monastery" is the village of Al Milga. 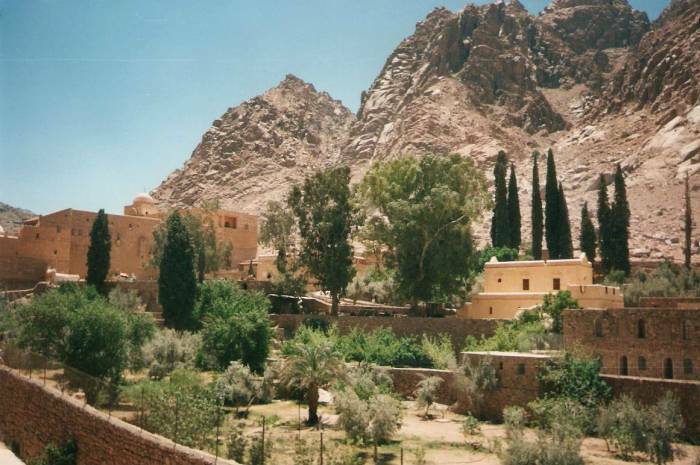 The inland bus from Dahab runs to Al Milga, but you should be able to get the driver to drop you at that road intersection halfway between the village and the monastery, saving you a kilometer or two of walking. The approach described below traces a sort of backwards "S" shape from the monastery — starting toward the southeast toward a ridgeline, making a 180° turn to your right and climbing, then a tighter 180° turn and climbing much more steeply through the final third of the total elevation gain. The building labeled as being at the peak is a rather small chapel, as you'll see below. But as you'll also see below, there isn't much of anything else in the area, and so even a small chapel stands out as an aviation landmark when it's a light color and isolated on a peak. Here you see the mountain itself. This view is from the approach, walking from the village of Al Milga toward the monastery at the mountain's base. We're around that Y-shaped intersection where you can get out of the bus, about 4 kilometers from the peak. The mountain is known locally as Gebel Musa, or the Mountain of Moses. The summit is at 2,285 m or 7,497 feet. OK, so which mountain is which? The Hebrew Bible speaks of both חר סיני or Har Sinai, or Mount Sinai, and חר חרב or Har Horeb, or Mount Horeb, with Mount Horeb used more often. It seems that these are two names for the same mountain. Har ha-Elohim or חר חאלחים meaning The Mountain of God or The Mountain of the gods. Har Bashan or חר בשן meaning The mountain of Bashan, with Bashan thought to be a corruption of beshen or with the teeth and referring to the sustenance provided to the Israelites in the desert. Har Gebnunim or חר גבננים meaning The mountain as pure as cheese. Really. Meanwhile a Rabbinic tradition says that Sinai comes from שנאה or sin-ah, meaning hatred and referring to all the other nations hating the Jews because of jealousy over their being the ones to receive the word of God. The Arabic name is Jabal Mūsa, or Gebel Mūsa here in Egypt, The mountain of Moses. 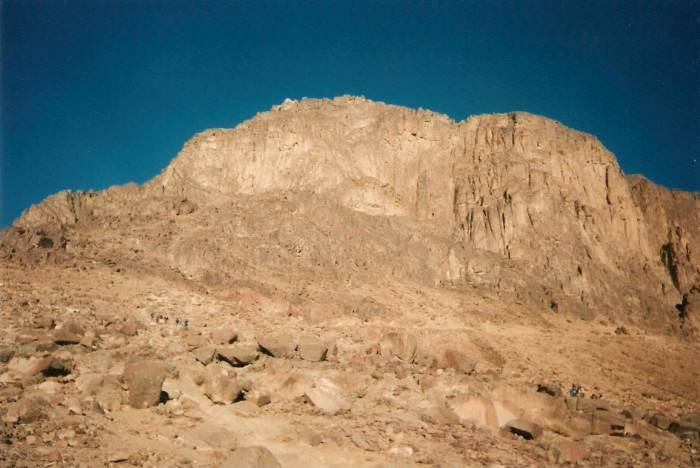 In the Quran it's call "The Mountain of Sinai", Tūr Sīnā or Tūr Sīnīn. The Song of Deborah is considered by some textual scholars to be one of the oldest parts of the Bible, dating to perhaps as early as the 12th century BC and therefore one of the earliest examples of Hebrew poetry. It suggests that Jahweh dwelt at Mount Seir, in Nabatea in northwestern Arabia near Petra. The narrative of Elijah was written in a way that suggests that the specific mountain, wherever it was, was well known at the time. Elijah lived in the 9th century BC, his story in the Books of Kings was written after 560 BC. The history gets more vague over time. Josephus said only that Mount Sinai was somewhere within Arabia Petraea, a large Roman province with its capital at Petra and covering modern Jordan, the southern part of modern Syria, the Sinai peninsula, and northwestern Saudi Arabia. The Epistles of Paul get even more vague, saying that it was "in Arabia", which could be anywhere that Josephus mentioned plus a larger surrounding area. It seems that it was a much later Christian tradition that considered Mount Sinai to be in this triangular area joining Africa to Eurasia. In other words, this triangular area is called "Sinai" because the Christians of Europe decided that the mountain must be here somewhere. 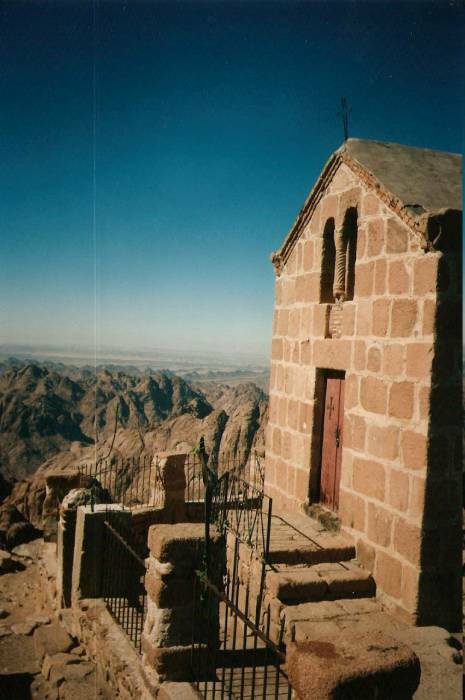 A group of Anchorites, a ascetic monastic order, settled on Mount Serbal in southern Sinai in early Christian times, and in the 4th century they established a monastery at its base. This is a 2,070 meter peak, the fifth highest mountain in Egypt. The problem is that Serbal is the fifth highest, while Josephus had written that Mount Sinai was the highest in the region. There was debate, and perhaps confusion, over which was the tallest. What today is called Mount Catherine is really the tallest, at 2,629 m or 8,625 feet, while the peak of Gebel Musa is at 2,285 m or 7,497 feet. We're back to sketchy surveying and confusion over relative heights. 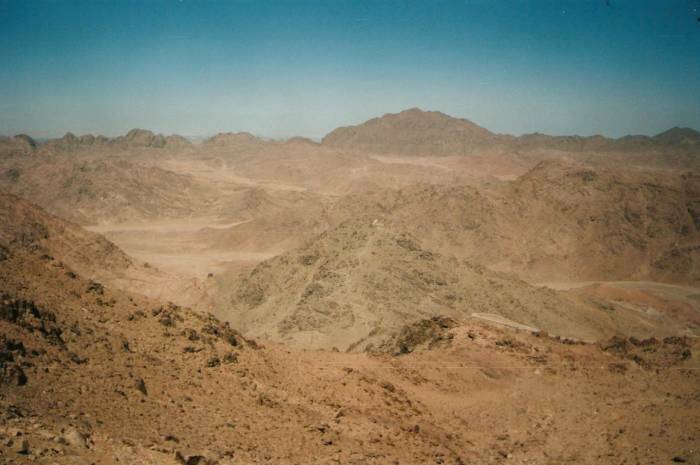 The mountain currently called Gebel Musa was the one that Bedouin tradition held to be the one where God gave the laws to the Israelites. 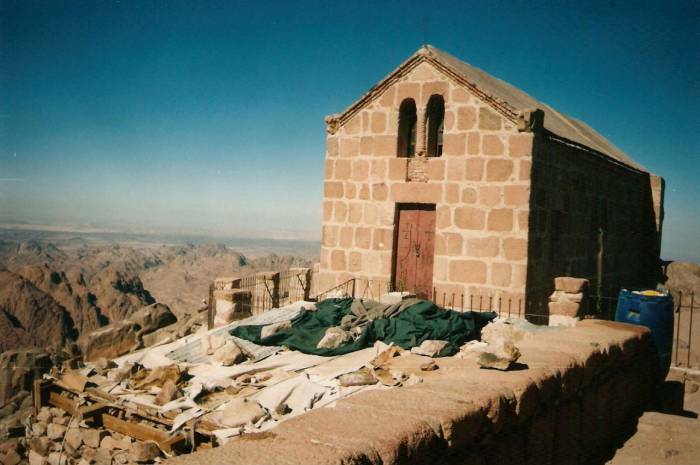 The Monastery of Saint Catherine, or Μονή της Άγίας Αικατερίνης as the Greek Orthodox monks living there commonly call it, is at the base of Mount Sinai. This is one of the oldest working Christian monasteries in the world, built in 548–565 by the order of the Byzantine Emperor Justinian I. There was already some monastic life in the place, as described in a travel journal written around 381–384. 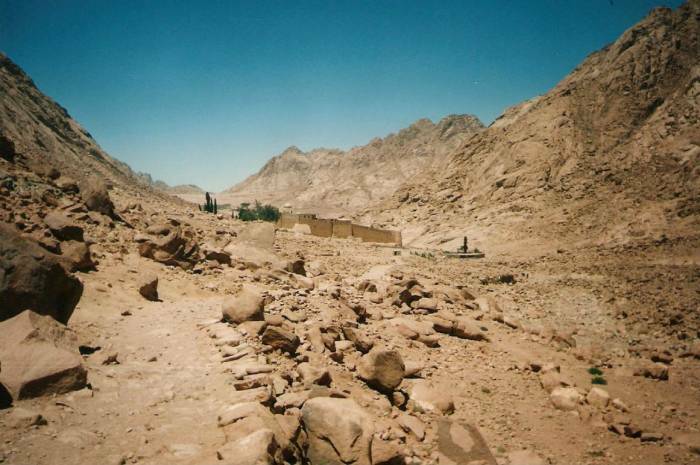 Mount Sinai is behind the monastery and to the right in this picture. The full and formal name of the monastery is really the Sacred and Imperial Monastery of the God-Trodden Mount of Sinai, but "Monastery of Saint Catherine" is the commonly used name. Tradition says that Catherine of Alexandria was a Christian martyr sentenced to death by the Roman Emperor Maxentius. She was to be killed by torture on a spiked wheel. It flew into pieces when she touched it. Hence "Saint Catherine's Wheel" is the name for spinning fire-spewing fireworks. The broken wheel couldn't kill her, so they beheaded her. 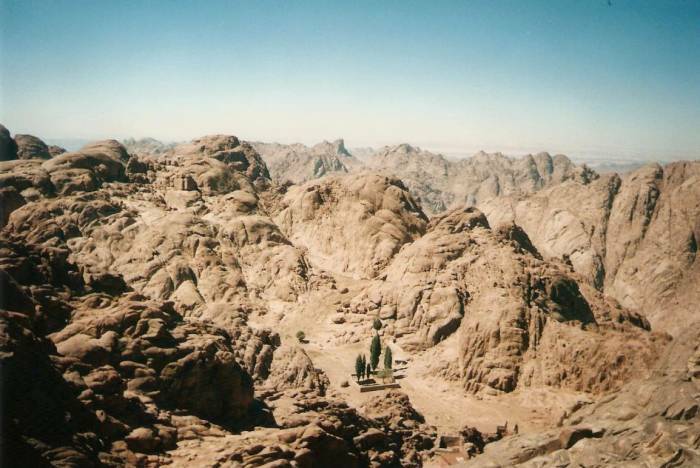 Then angels transported her remains to Mount Sinai, where monks found them around the year 800. Complete with hair still growing and a constant stream of healing oil issuing from her body, according to one version. Westminster Cathedral in London has what it says is a phial of that oil, brought back by Edward the Confessor. The monastery in Rouen, in north-central France, says that it has her fingers. Despite a complete lack of historical evidence for an actual Catherine, she became one of the most important saints in the religious culture of the late Middle Ages, one of if not the most important of the category of virgin martyrs. The monastery constructed in 548–565 enclosed the Chapel of the Burning Bush, with a living bush in the monastery even today purported to be the one seen by Moses. In the past 100 years a number of very significant early documents have been found in its library — for example the Codex Sinaiticus, a 4th-century Greek Bible written in 330–350 CE. Its library preserves the second largest collection of early codices and manuscripts in the world, outnumbered only by the Vatican Library. Major texts are in Greek, Coptic, Arabic, Armenian, Hebrew, and Syriac texts. The Codex Sinaiticus is the earliest known complete copy of the New Testament. It originally had about 1,487 pages. It was split up, with pieces going to Russia, England, and Germany. Some pages were lost along the way, just 823 of the original pages are available today. CodexSinaiticus.org lets you access all of its pages available today. Here I am starting up the winding path to the summit of Mt Sinai. The sane approach is to take the relatively gentle "camel path", known as Siket El Bashait, and climb the mountain during the day. Seriously. Trust me on this one. Climb the mountain during the day, take your time, and enjoy the scenery. Here we're looking back from just a little way up the camel path. You see the Monastery of Saint Katherine back down the valley. The road intersection is further back down that valley, and the village of Al Milga is around the mountain to your left in this view. In the second picture above we are looking up at the summit of Mt Sinai from the path. A white spot is barely visible just to the left of the highest point. That is the small Greek Orthodox chapel at the summit. A small Greek Orthodox church had been built on the summit in the 16th century. It had crumbled into ruins by the time that this chapel was built in its place in 1934. Our route will take us off to the left, circling counter-clockwise around the peak. 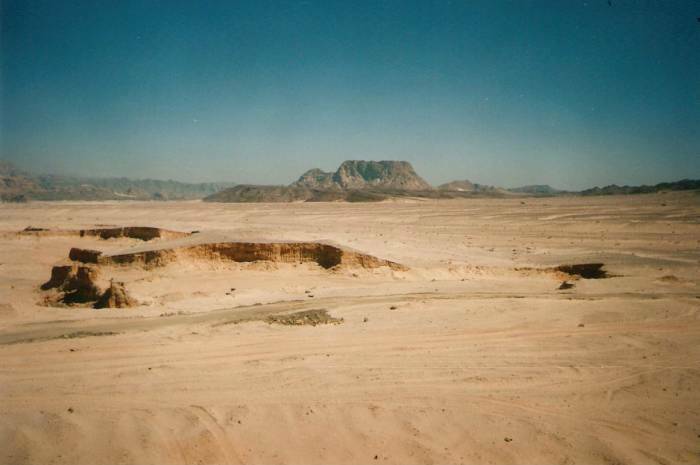 In the second picture above we are looking north across the Sinai mountains from about half-way up Gebel Musa. 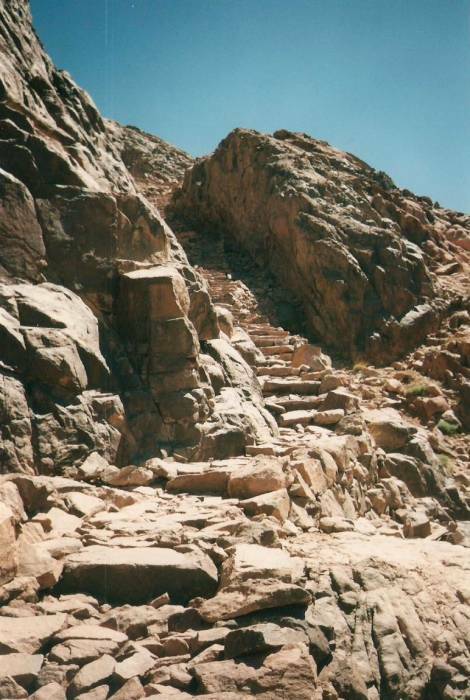 This is where the camel path joins the Stairs of Repentance near the summit. It's a 3750–step staircase, part of the brutal direct route also called Siket Sayidna Musa. Consider that name very carefully — unless your goal is repentance, the camel path is the preferable route! You will still join the Stairs of Repentance for a short distance near the summit. It will be more than enough. Elijah's Spring is a very small spring near the summit. It has a few hardy trees and shrubs, probably the only naturally occurring green plants for a hundred kilometers. This view of Elijah's Spring is from the Stairs of Repentance from close to the summit. Elijah, whose Hebrew name אליחו or El-i Jahu means My God is Yahweh, was a prophet in the 9th century BC who appears in the Hebrew and Christian Bible and the Qur'an. He spent time in the wilderness, living in a cave on Mount Horeb. 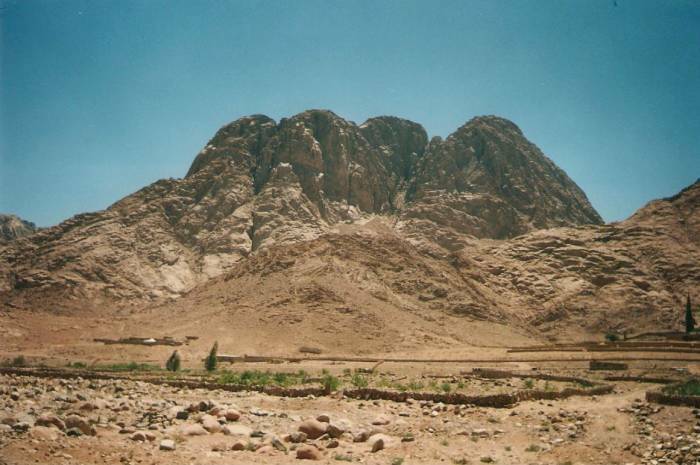 As mentioned earlier, it seems that Mount Horeb is simply another name for Mount Sinai. Finally, we're at the summit! This is the small Greek Orthodox chapel at the summit. In the far distance the view is toward the west, toward the western coast of Sinai and the Gulf of Sinai. 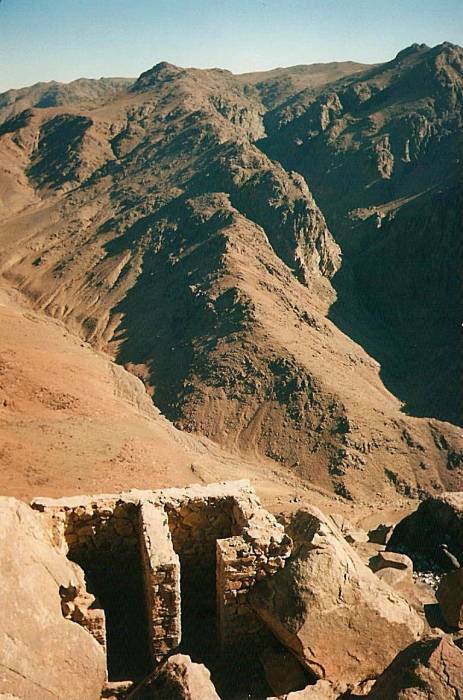 Just in front of the chapel you see the rough roof of one of the lean-to tea huts run by some Bedouins at the summit. Below, we're looking north from the summit in the afternoon. Facilities are limited, these pit toilets appear to date back to the era of Moses. Gebel Katherina is just out of view to the right in the following picture, and further away than the peaks seen here. I brought some water, some juice, and something to eat. And then I rented some heavy wool blankets from the Bedouin tea hut. It's hot in the day as you climb the mountain, but it gets pretty cold at night during April when I was there. 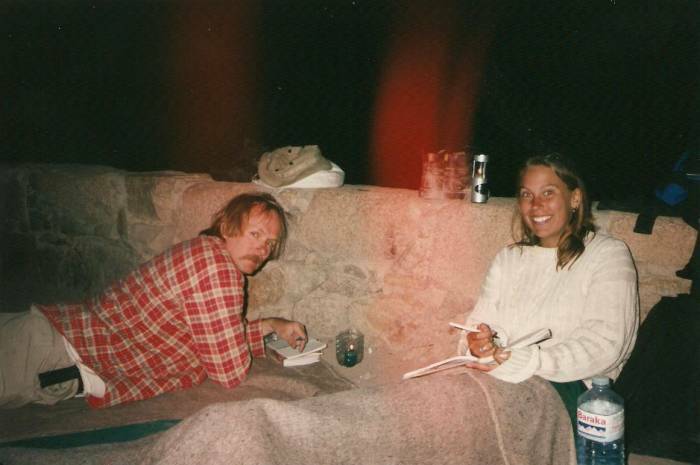 Desert climate, mountain elevation, all that contributes to cool, clear nights on the summit. Only three of us had the good sense to climb the mountain during the afternoon and stay the night on the summit. It's a spectacular place to spend the night — more stars than you can imagine, and the Hale-Bopp comet was very prominent when I spent the night. About 0430 you're rudely awakened by a mob that has done a fast forced march up the Stairs of Repentance during the night. They arrive just in time to see sunrise and then march back down again. Here we are hiking back down with said mob. What about the historical reality of the Exodus from Egypt, named from έξοδος or "going out"? Modern scholars say that there isn't much. It certainly wasn't like we saw in the Cecil B. DeMille version. Actually, when you watch the classic movie with Charlton Heston, you will see a number of things that aren't in the Bible. Some of these are from the Quran. The end credits of the movie say that it was based on the holy scriptures, it doesn't clearly specify which ones. Rabbinic Judaism dates the Exodus to 1313 BC. Based on 1 Kings 6:1 saying that it happened 480 years before the construction of Solomon's Temple, widely accepted chronologies initially put the Exodus around 1450 BC, during the 1479–1425 BC reign of Egyptian Pharoah Thutmose III. This was after the roughly 1600 BC catastrophic explosion of Thera or Θήρα, the once Minoan, briefly Italian, and now Greek island also known as Santorini. Its destruction has been theorized as somehow connected with the described plagues in the Biblical story. But then archaeological discoveries in Egypt and Canaan showed no signs of the described events. A "late Exodus" around 1200–1250 BC was the model in the mid-1900s, but now that model has also been largely abandoned. The Torah was only compiled in written form during the Babylonian Exile in the 6th century BC or soon after, so about 800 years after the Exodus events it describes. Older traditions exist, detectable in the 8th century BC prophets Amos and Hosea, but today's Biblical scholars see the story as theology and not history. There is no archaeological evidence for the exodus, but there is archaeological evidence for largely Canaanite origins of Israel. This includes cult-objects of the Canaanite god El, pottery in the Canaanite style, and the use of an early Canaanite alphabet. A number of anachronistic details in the story, including place names, changes in Egypt's large-scale military and political concerns, and even the mention of a domesticated camel, not introduced into Egypt until a Persian invasion in 525 BC, suggest a setting in the 1st rather than the 2nd millennium BC. The story itself has large logistical impracticalities. Exodus 12:37-38 and Numbers 1:20-50 describe a group of 600,000 men on foot plus women and children. Those plus the elderly and the "large number of other people", non-Israelites, would have totaled about 2,000,000 people. A group of 2,000,000 people marching ten abreast would form a column about 150 miles long. Also, the entire population of Egypt around that time was around 3 to 3.5 million people. There is no indication that Egypt suddenly lost over half its population during this time. There is archaeological evidence of the Hyskos people moving from Canaan into Egypt around 1800 BC and being expelled around 1560 BC. At least that aligns more closely with the Thera / Θήρα cataclysm. The 1st century AD historian Josephus Flavius discussed the parallels between the Exodus of the Israelites and two Exodus-like events possibly involving those Hyskos. After the descent from Mount Sinai, it was back to Dahab for a couple of days that turned into a week and a half. There are lots of places to stay for next to nothing, and all sorts of places to hang out. Here it's a clear day and you can see all the way across the Gulf of Aqaba to the Magic Kingdom of Saudi Arabia. I met a guy who did maintenance work at a Canadian-run hospital over in Saudi Arabia. He described it as like a medium-security penal colony. Walled in, in the middle of the desert, you could only leave the compound with special permission (that you generally couldn't get). Once every six months he had a chance to leave briefly. And bizarrely he really liked it and was looking forward to signing up for another year. He had a couple of interesting stories about Saudi Arabia. One is that there is good money in being a distributor of Nyquil cold medicine and Aqua-Velva aftershave. Since you can get drunk drinking them and they're legal to possess in Saudi Arabia, they go for a lot of money. When you go down to the beach in the morning, you find empty Nyquil and Aqua-Velva bottles everywhere. And speaking of empty bottles on the beach, wealthy Saudi families like to "take part" in cleanup programs. What they do — send their Bangladeshi indentured servants down to the beach or the roadside to clean up the real trash. Then they plant a few pre-selected clean empty items. Then the family sweeps up in their air-conditioned luxury cars, jumps out and picks up the few pieces of planted "trash" in a few seconds, and jumps back into the cars. There's great diving right around the Dahab waterfront, and even better at the Blue Hole just a little way up the coast. The Gulf of Aqaba, the body of water between the eastern coast of the Sinai and Saudi Arabia, is deep and it drops off quickly close to shore. This is part of the Great Rift Valley running through East Africa, up the center of the Red Sea, north through the Gulf of Aqaba and on north to end in the rift valley containing the Dead Sea. The Red Sea and the connecting Gulfs are famous for their wealth of coral and fish. The Blue Hole is a very popular diving location, but scuba divers have to be careful to stay within their limits. It's a submarine sinkhole in the reef some 130 meters deep. The water is very clear, and you get a strong sensation of flying when you swim over the sharp edge of the dropoff into the sinkhole. Someone with a fear of heights would have a hard time snorkeling there. The dangerous temptation is posed by "The Arch", a tunnel about 52 meters down connecting the sinkhole to the open water beyond the reef. It's significantly below the recognized 40-meter limit for safe recreational diving on normal air. A mixed-gas system with redundant supply is recommended, as you're not only well below the point where nitrogen narcosis becomes very significant, but you would also have to contend with currents through the tunnel and disorienting lighting effects. The Blue Hole is often referred to as "The Worlds Most Dangerous Dive Site" given the number of diving fatalities that have occurred here. Take the number of fatalities reported by the Egyptian authorities and multiply by at least two. The Muhamed Aly Camp was very nice, it's right by where the Bedouin pickup truck rides from the bus stations in town stop. 5 E£ (US$ 1.50) for a basic hut or 10 E£ (US$ 3) for a nicer one. All of them are within a stone's throw of the waterline. There are plenty of places to hang out. After a while you can rent mask, fins and snorkel and get in the water. The waterfront places have good food and a wonderful setting. Dahab is plagued with flies, but then so is all of Egypt. The book of Exodus describes a plague of flies, but the real miracle here is the end of the plague of flies. To plague Egypt with flies — that's nothing. That's like putting sand in the Sahara Desert. But to cause all the flies to disappear from Egypt, that's a truly impressive miracle! 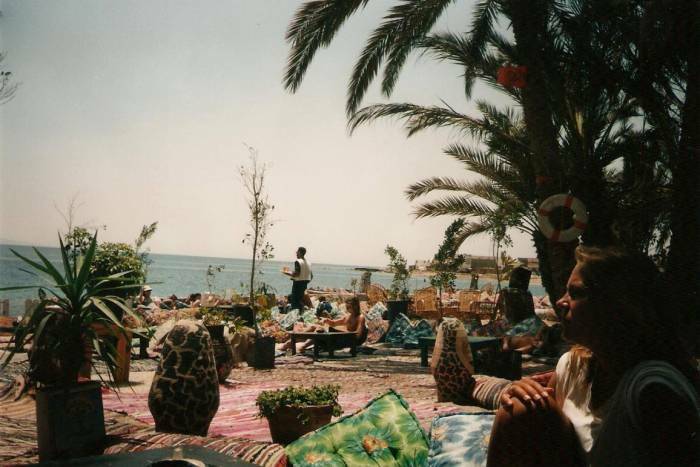 The locals, either truly local Bedouins or "mainland Egyptians" from along the Nile who have relocated to Dahab, will tell you a story that is picturesque and might be true. Supposedly the Bedouin who first settled the location and formed a fishing village came to call it Waqaat Thahaab, which literally translates to Time Goes. This referred to how you easily lose track of time as the days run together in this place. The name was shorted to Thahaab, which I suppose means either Time or Goes although neither word by itself really helps this story along. Then western independent travelers heard Thahaab as Dahab and we came to use that name. Well, if the Israelites did spend 40 years in what we call the Sinai Peninsula today, it makes sense that they wandered into Dahab and stayed there the whole time. I eventually left Dahab by bus, going north to Nuweiba. From there I caught a ferry to Aqaba in Jordan. If you're going to travel in an Arabic-speaking country, learn how to read Arabic numerals! Really these are Hindu numerals, as adopted and used by the Persians and Arabic speaking people. This was when Europe, to the extent it used numbers at all, used Roman numerals. Hindu mathematicians had developed positional numeral systems — the concept of the ones digit, the tens digit, the hundreds digit, and so on. They had also developed the concept of a numeral to indicate zero. Roman numerals had none of that, making them useless for calculation and cumbersome for simple record keeping. 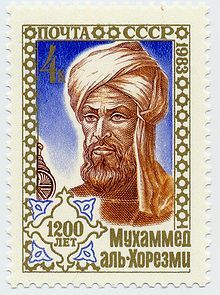 Soviet Union postage stamp on the 1200th anniversary of al-Khwarizmi's birth in what then was Soviet territory. About 825 AD the Persian mathematician Muhammad ibn Musa al-Khwarizmi (Muhammad, the father of Jafar, son of Musa, the Khwarizmian) wrote a work titled On Calculation with Hindu Numerals. This is the same al-Khwarizmi whose name is the basis for the word algorithm. Al-Khwarizmi was called that because he was from the Khwarizm region south of the Aral Sea, near Khiva, along the Amu Darya river between today's Uzbekistan and Turkmenistan. In 1145 the Englishman Robert of Ketton translated al-Khwarizmi's treatise on algebra (yet another Arabic word) in Latin, opening it with "Dexit Algorithmi ..." or "Algorithmi says ...", leading to today's word "algorithm". In the early 1200s Leonardo of Pisa, known as Fibonacci, had learned about Hindu-Arabic numerals in North Africa and introduced them to Europe.